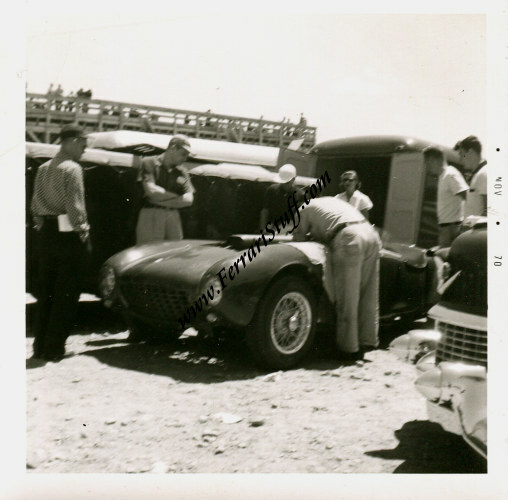 Vintage 1955 Photograph of Duncan Black's Ferrari 375MM S/N 0382AM July 1955. This photo was taken either on the 1st of July 1955 or on the 4th of July 1995. It can be dated so exactly as the photo belongs to a series that was shot on the 4th of July 1955 at the SCCA Beverly meeting and given the fact that the car did not yet bear its make-shift racing number "14" in this photo, it was short early in the morning of that 4th of July. The car raced twice that day, once in race 3 which it didn't finish and once in race 7 in which it came in second in class and third overall. Black acquired the car in July 1955 and raced it not less that 25 times until he sold it on in 1960. The car now seems to reside in Austria.